This was the important part of the trip for me. I like to eat! However by the end of the trek I could barely stand the sight much less the taste of the Nepali Himalayan food. First of all let me describe how the food is cooked and the process of a hungry tourist trying to get food. After a long day hiking on the trail you arrive at the lodge, more often then not, in the dark. There will be a few tourists or maybe none at all depending on the season and your arrival time. The lodge is usually owned by a Sherpa family. There will be one or two openings in a concrete stove to let the heat through from the fire. 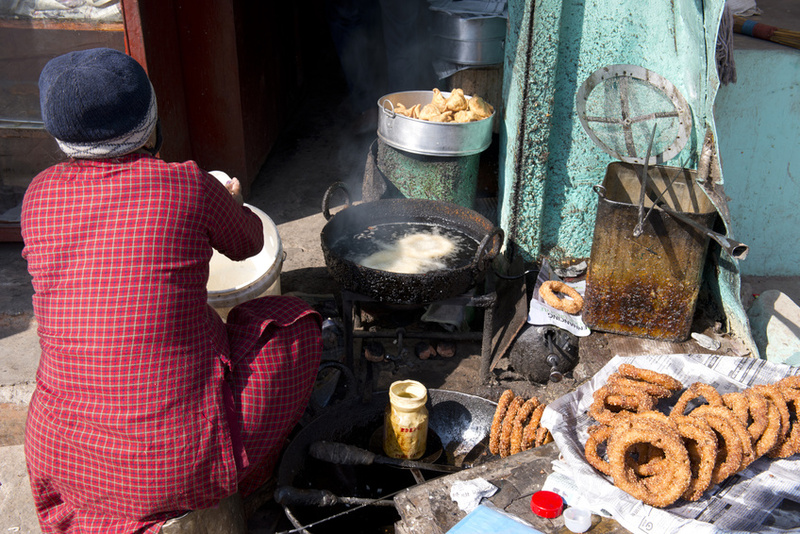 The locals use these openings for cooking a large variety of dishes. Each lodge that we stayed at had a large selection of dishes, often times over 40 selections. Our group would get into the lodge, tired, suffering from the altitude, and some of us were starving. We would all order any number of dishes and then submit our order to usually a single cook. Our orders were entered in a notebook provided by either our group or the lodge. The selections on the menu ranged from porridge, cabbage, noodle soup, and bread. There were many types of soup and other selections. Our group would order many different items. A single cook, usually the mother, would cook all these dishes on one or two or three openings in the wood fed stove. We would wait up to 2 hours before all the dishes had been served. Say if 5 people in our group ordered a soup, they would cook all the soup at once. Then if only one person ordered porridge, they would have to cook that separately and take up one of the spaces on the stove. There were usually children present helping out with the cooking, and carrying dishes from small kitchen to the dining room. Sometimes the kitchen was the dining room! We ate for the most part just two meals a day. In the midday we would munch on snacks that we brought from our home countries. At every meal the group would split the cost of ordering large pots of tea. We had tea every day on the trail. I became quite sick of the tea. You could either order black tea, or honey tea. The jugs that the tea came in were the same at all the lodges. The outside was very colorful and contained painted flowers on parts of the jug. You had to be very careful when handling these jugs because they would break quite easily. One of our members broke one and ended up paying a large sum of money to replace it.